With only two English Premiership matches today I have moved to the Continent for the main bet of the day. Which at the time of writing is paying a massive 12.9/1 with Bet365. It incorporates Nigeria to lift the African Cup of Nations and given their current run of blistering form doesn’t seem like a big ask. The rest of the bet consists of the big Italian 3, the factor that is increasing the odds so high is that 2 of the 3 are away from home. My second flutter for the day does involve the two Premiership games. 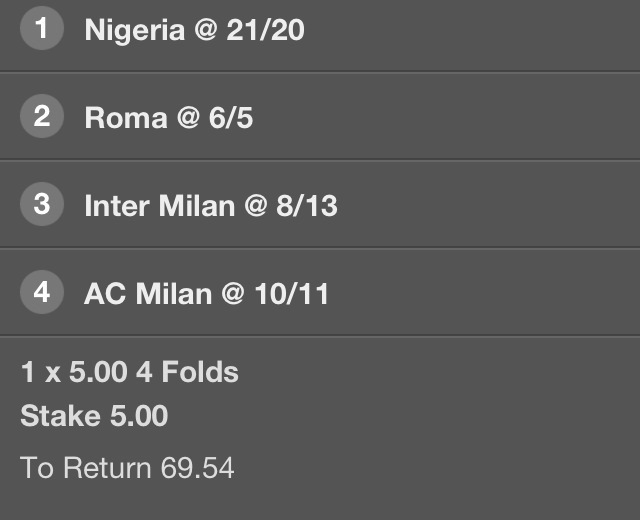 I’m praying for a Sunday full of goals for odds of around 4/1. If you fancied being a wee but safer you can knock the MUFC match down to over 2.5 goals and still get even money. 1. Aston Villa v West Ham : Over 2.5 goals. 2. MUFC v Everton : Over 3.5 goals. It’s a Mad Soccer Saturday! Happy Valentine’s Day – Have a wee bet!